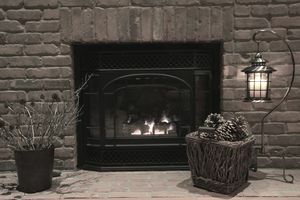 When you shop for gas logs you'll find there are two basic types: gas logs that vent to the outside just like a wood burning fireplace and gas logs that are not vented at all. You may hear the term unvented gas logs referred to as vent-free gas log fireplaces. Burning gas or wood produces carbon monoxide, a potentially lethal gas, so you might wonder how a fireplace can be safely used without venting its wastes to the outside. Unvented gas logs are designed to produce a very hot flame that results in nearly complete fuel combustion, decreasing the levels of carbon monoxide and soot that are produced by other gas logs. Unvented gas logs are always equipped with an Oxygen Depletion Sensor (ODS), which is designed to turn off the gas before carbon monoxide reaches a dangerous level in the room and chokes the living life out of you. It's a good idea to install one or more carbon monoxide detectors in your home, no matter which type of fuel-burning appliance you have. Detectors are an inexpensive way to put your mind at ease about carbon monoxide levels. In fact, a carbon monoxide detector is required by law in California to be installed on each level of your home. If your California home has an attached garage or a fossil fuel source, it must have a carbon monoxide detector. Where Can Unvented Gas Logs Be Installed? Unvented gas logs can be housed in a masonry fireplace or in special fireboxes made to resemble a hearth. Most vent-free gas logs are housed in a firebox but they can also be mobile fireplaces, which you can move around in your home. There is controversy around vent-free gas log fireplaces as people become more concerned about the dangers inherent with such gas-powered devices. Not to mention, some people do not know how to safely operate a vent-free gas log device. Water is another byproduct of combustion. If you have vented gas logs, most of the moisture escapes out the vent, but when you use unvented gas logs the extra moisture enters your home. That can be a plus for many homes during dry winter months, but if your home is tightly insulated, or you have a humidifier, the excess moisture might show up as condensation on cold windows. If your walls are not insulated, the moisture can attach itself to your interior walls and possibly dampen fabrics in the room where the vent-free gas log fireplace is installed. Unvented gas logs generate a lot of heat. Keep combustibles away from the fireplace. Always leave the fireplace doors open during use. Only burn the gas logs for a few hours at a time. Never go to sleep and leave unvented gas logs burning. Open a window slightly while the gas logs are burning, to let fresh air enter the room. Bigger is not always better. For best air quality, the gas fireplace unit you install should be approved for the size of the room it will be used in. Unvented gas logs are not legal in all areas, so check your local building codes before buying a gas appliance to make sure it is permitted. If you burn down your house because you were using a vent-free gas log fireplace, and it was not allowed in your building code, your insurance policy might use that fact as a way to legally wiggle out of paying your claim. Always follow the manufacturer's instructions when using any type of fuel-burning appliance.